Lock in a great price for The Resort at Pedregal – rated 9.6 by recent guests! This resort exceeded every expectation. Our friends stayed down the beach and in this case, location matters. We stayed in a spacious and tastfully decorated suite with ocean views. The pool-side bar offered a stunning view of whales while we ate the best ceviche ever tasted and enjoyed beautifully crafted cocktails. The staff was amazing...friendly and extremly accommodating. We really cannot express how fantastic this place truly is. You will never want to leave. The service staff was over the top. A man named Fernando was our pool guy and his service and attention to details were great. The restaurants were exceptional. We had a wonderful time and have already told others about the place. Loved everything about this resort! The staff was even wonderful. 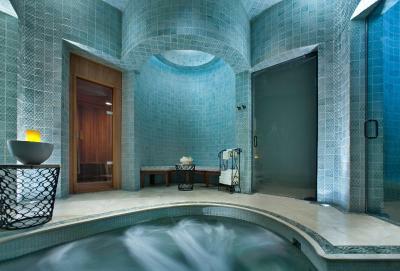 The spa is amazing rated number 1 in Mexico. And the service within the resort was amazing the people are lovely and wonderful to deal with. I have called this peaceful solitude. It is one of the only places that offers the safety and security that I insist on. This was probably the best place I have ever stayed. It was a little pricey but worth every penny. From the moment we arrived the staff made us feel like we were their top priority. The resort was full of beautiful infinity pools and lounge areas overlooking the ocean. Even though we were there over a weekend the property was far from crowded and felt very private. The grounds were immaculate. We loved the fresh guacamole and chips brought to our room every late afternoon. Some of our favorite moments were sitting on our balcony in our mini infinity pool watching the sun set over the Pacific. Service was amazing! Resort is beautiful. Staff is excellent! Great Location, steps from the Marina!! I loved everything about this Resort!! 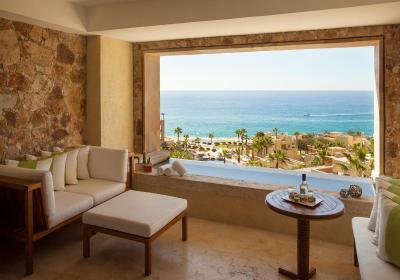 The Resort at Pedregal is a stunning resort in an amazing location in Cabo San Lucas. The rooms are large and beds are spacious and the complimentary guacamole and margaritas at 5pm make it that much more special. The staff at the hotel are extremely helpful and nothing is too much trouble. I travelled with a girlfriend and we thoroughly enjoyed our time. The Resort at Pedregal This rating is a reflection of how the property compares to the industry standard when it comes to price, facilities and services available. It's based on a self-evaluation by the property. Use this rating to help choose your stay! The Resort at Pedregal features private pools in the rooms, has its own private beach area, and state-of-the art fitness center. Guests are welcomed with a free margarita cocktail. 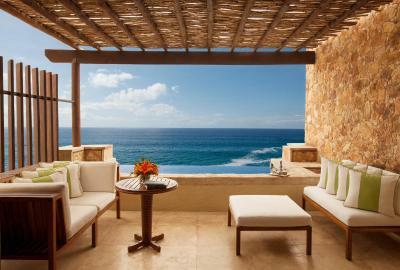 Free Wi-Fi, an ocean view, and complimentary tequila bottle are standard in each room at the Resort at Pedregal. Extras include a Nespresso® coffee machine and 24-hour room services for a fee. The Resort at Pedregal has 3 restaurants offering contemporary Mexican cuisine and seafood specialties. The rooms have fresh fruit service, noon snacks, and drinks provided everyday. 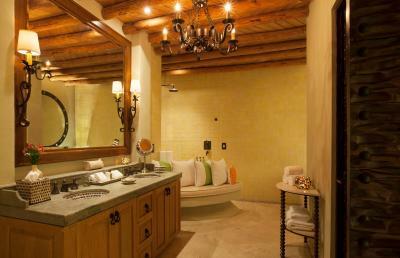 A sauna, massage services, and spa as well as hot bathtubs are among the Resort at Pedregal amenities. Guests can enjoy nearby activities such as snorkeling, diving, and fishing. Los Cabos International Airport is 28 miles away, which guests can reach by arranged airport shuttle service for a fee. The resort is also only just over 1 miles from Central Cabo San Lucas. This property also has one of the top-rated locations in Cabo San Lucas! Guests are happier about it compared to other properties in the area. 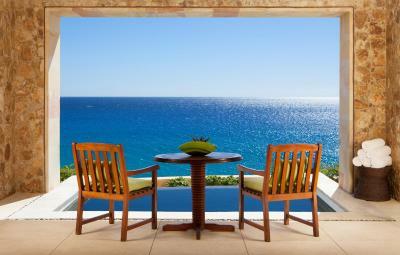 When would you like to stay at The Resort at Pedregal? 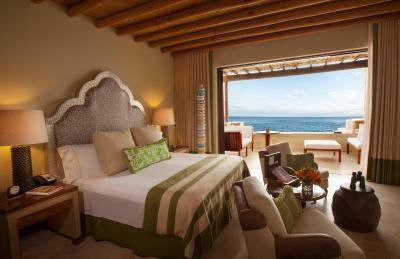 The King Room has air conditioning, a comfortable seating area and a private pool located on a terrace with sea views. The private bathroom has shower, tub, free toiletries and marble floors. A flat-screen TV with cable channels, mini-bar, and fridge are also available. Please note that The Resort at Pedregal will be under renovation works from 13th September to 19th September, 2015, and there will be some noise and the spa will be out of order. The Deluxe King Rooms are located on the upper floors of the building and offer panoramic views of the beach, the sea and the canyon cliffs from its balcony. This air-conditioned room has a seating area and a private pool located in a terrace with sea views. The private bathroom has shower, tub, free toiletries and marble floors. A flat-screen TV with cable channels, mini-bar, and fridge are also available. The Two Bedroom Ocean View Suite is laid out as a one level accommodations featuring living and dining area, leading on to a large entertainment terrace with private plunge pool. This Suite features a separate powder room and hallway leading into the master bedroom suite, offering a king-size bed, fireplace, wardrobe and bathroom with double vanities, tub and a separate walk-in rain shower. This room also has a private terrace. The second bedroom has two queen-size beds, single vanity and a walk-in shower. Outfitted with beautiful interior design, the two bedroom ocean view suite includes murals from local artisans and color palettes that mimic the arid beauty of the Cabo San Lucas, Mexico setting. The Three Bedroom Ocean View Suite is laid out as a one level accommodations featuring living and dining area, leading on to a large entertainment terrace with private plunge pool. This Ocean View Suite features a separate powder room and hallway leading into the master bedroom suite, offering a king-size bed, fireplace, wardrobe and bathroom with double vanities, tub and a separate walk-in rain shower. The second and third bedrooms offer two queen-size beds, single vanity and walk-in shower and are most suitable for children or guests requiring separate beds. 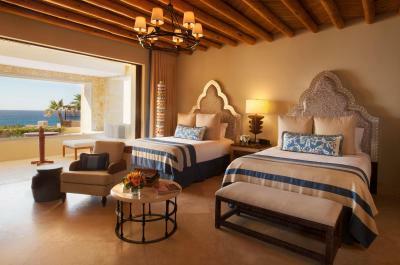 Outfitted with beautiful interior design, evoking the Mexican destination, the three bedroom Villa includes murals from local artisans and color palettes that mimic the arid beauty of the Cabo San Lucas setting. This large suite comes with a fire place, a seating area and a terrace with a private infinity-edge pool and views of the ocean. There is a private bathroom with a double vanity, shower and free toiletries, as well as a flat-screen TV with cable channels. 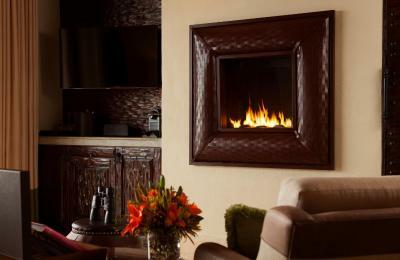 These spacious rooms offer an inviting fireplace and two queen beds. 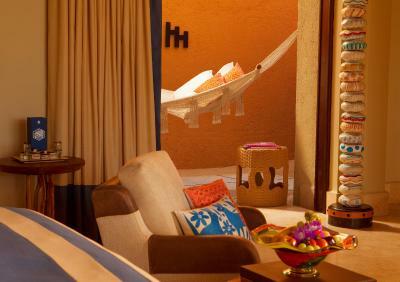 The room also features a private terrace that has its own private plunge pool with infinity edge and a spectacular ocean view, a rainforest and separate handheld shower, as well as a separate tub, an LCD television with a variety of preferred channels, plus a complimentary soft drink refreshment center. 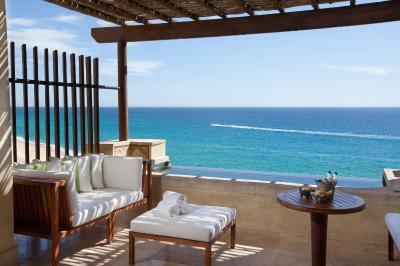 These rooms are located on the corners of second and third floors, offering panoramic views from the ocean to towering cliffs of Pedregal Mountain. The spacious rooms feature natural lighting, an inviting fireplace, private terrace that has its own private plunge pool with infinity edge and a beautiful ocean view. 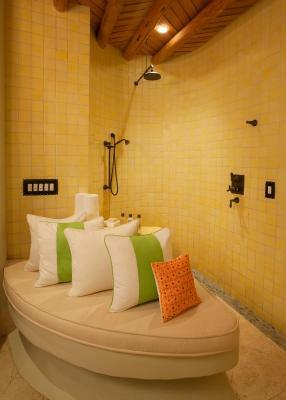 The bathroom includes a rainforest and separate handheld shower, as well as a separate tub. Amenities include an LCD television with a variety of preferred channels. These spacious suites feature a master bedroom with 1 king-sized bed, separate living area that expands out into a private outdoor terrace, an infinity-edge plunge pool and fire pit overlooking the ocean front, custom-made furniture, light fixtures, and artwork, fireplace, iPod dock, an LCD television with a variety of preferred channels and binoculars for whale watching. 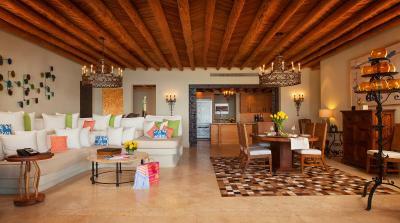 House Rules The Resort at Pedregal takes special requests – add in the next step! The Resort at Pedregal accepts these cards and reserves the right to temporarily hold an amount prior to arrival. 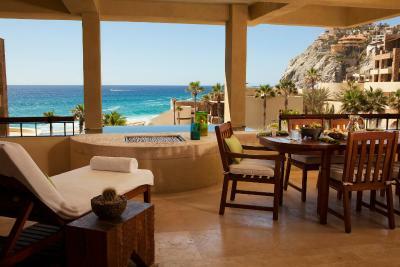 The The Resort at Pedregal offers flexible check-in and check-out schedules. For security reasons, the credit card used to secure the reservation must be presented at check in together with a valid photo ID, otherwise deposit won't be valid. In case of cancelation or modification inside the period of cancelation fees, the penalty will apply including taxes. We had spa services two different days and it seems like the therapist are pushed to sell you product. I would think that a part of your standard massage would include oil but it was put to us that if you wanted oil for your massage you would have to purchase a bottle of it. I have had 100's of massages in the US and never experienced this sales pitch. The mosquitos. Tons of mosquito bites. Saw the bug spray in our room at the end of our visit. Wish they gave us a warning about the bugs. There really isn’t anything negative to say other than the location of our room didn’t allow us to see the sun set or rise...but that’s okay because we had ocean view. The resor has a beautiful restaurant at the end of the beach that is exceptionally over rated. And the service wasn't that good and the food leaves a lot to be desired. The only thing it has going for it is the view other then that ver very disappointing. "Seared" Is much much better. I wanted to share my 5 star experience at the Resort at Pedregal. I've stayed at numerous 5 star properties all around the world and the Pedregal is hands down one of the best if not the best. You're experience begins before you even arrive. The concierge reached out to me via email to ask if I had any restaurant or activity requests that he could arrange. Gino our personal concierge was extremely helpful and set up all my restaurants reservations and seamlessly set up the airport transfers. Upon arrival we were greeted with fresh margaritas. The property is immaculately maintained and very welcoming. Then just when I thought can't get better than this they upgraded us to a 3 bedroom suite with plunge pool and ocean view! The room was not only amazing but impeccably designed. They had a full fridge with complimentary waters and sodas restocked each day. Fresh chips salsa, guacamole and Coronas delivered every afternoon. Couldn't have asked for better accommodations. The service is next level...they anticipated very move and detail from greeting us by our names to making sure everything is perfect at the pool room and restaurants. Amazing fresh cocktails prepared pool side and they freshest ceviche I've had. Truly a place to relax unwind and unplug. I would recommend this property to all and certainly will return. Mil Gracias to all the exceptional staff at the Pedregal! I would choose a room higher up so as not to look out at some lower roofs. The food was overpriced. I was disappointed, that at this price point, there were so many tattooed, sloppy, branded T-shirted people, who didn’t try, even a little, to dress up! The overall experience is wonderful.